Ross Lake Park is popular with anglers, boaters and swimmers. A picnic area, beach, hiking trail and boat launch (electric motors only) offer opportunities for an enjoyable family picnic or evening stroll. This park offers a pleasant beach on the lake that is popular with locals for swimming and afternoon BBQs. This park is located off Hwy 16, near Hazelton, B.C. Ross Lake Park offers a wonderful setting for easy access canoeing and kayaking. Ross Lake Park offers a wonderful setting for easy access boating with only electric motors allowed on the lake. Ross Lake Park is a popular year-round fishing spot. B.C. Ministry of Environment stocks Ross Lake with rainbow and eastern brook trout. Visitors can ice fish during the winter months. The lake has a boat launch but has an “electric motors only” policy. Ross Lake Park visitors can enjoy the gentle 3.5 km Rainmaker Trail that encircles the lake and offers views of the lake, the surrounding mountains and lakeshore vegetation and wildlife. For your own safety and the preservation of the park, obey posted signs and keep to designated trails. Shortcutting trails destroys plant life and soil structure. Ross Lake Park includes moose and black bear habitat and provides excellent opportunities for waterfowl viewing in the marshy lakeshore. Cross-country skiing is available on existing hiking trails. No tracks are available. Snowshoeing is available on existing hiking trails. Visitors can enjoy ice skating on Ross Lake. Check the thickness of the ice before venturing out and bring your own skates. Ross Lake Park is a popular year-round fishing spot. BC Environment stocks Ross Lake with rainbow and eastern brook trout. Visitors can ice fish during the winter months. The lake has a boat launch but has an “Electric Motors Only” policy. While campfires are allowed and campfire rings are provided at the picnic sites, we encourage visitors to conserve wood and protect the environment by minimizing the use of fire and using campstoves instead. Firewood may be purchased in the park or you may bring your own wood. Fees for firewood are set locally and may vary from park to park. Limited burning hours or campfire bans may be implemented. To preserve vegetation and ground cover, please don’t gather firewood from the area around your campsite or elsewhere in the park (this is a ticketable offence under the Park Act). Dead wood is an important habitat element for many plants and animals and it adds organic matter to the soil. 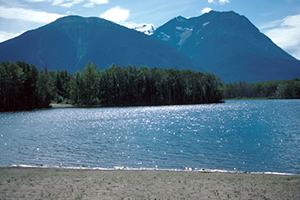 Ross Lake Park is popular with residents for day-use picnicking on the lakeshore. The park offers a pleasant day-use area with picnic tables, fire rings and pit toilets. The day-use area is open with services from May 15 to September 3. Note: the area is open all year, but the snow is not plowed during the winter.